Found one file extension association related to Adobe Production Studio and 1 file format developed specifically for use with Adobe Production Studio. Adobe Production Studio is a dedicated set of video post-production tools for Adobe Creative Suite family. Bring new power and efficiency to your film, video, DVD, and web workflows with Adobe Production Studio Premium software. 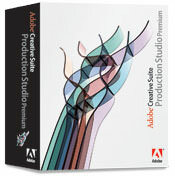 Part of the Adobe Creative Suite family, this complete audio and video post-production solution combines Adobe After Effects® 7.0 Professional, Adobe Premiere® Pro 2.0, Adobe Photoshop® CS2, Adobe Audition® 2.0, Adobe Encore® DVD 2.0, and Adobe Illustrator® CS2 software with the timesaving workflow features Adobe Dynamic Link and Adobe Bridge. If you need more information please contact the developers of Adobe Production Studio (Adobe Systems Incorporated), or check out their product website.